Dominic Brown is a 2006 left handed pitcher from Dade City, FL with a very athletic tall build at 6-6, 200 lbs. Brown has smooth, easy athletic actions in everything he does and might be almost as good an outfield prospect as he is a pitching prospect. On the mound, Brown had a tall, balanced delivery with a clean, smooth arm action and minimum effort delivery. He varied his release point a lot on his pitches, which made his command inconsistent, but he should be able to spot the ball effectively as he gains experience. Brown’s fastball topped out at 86 mph with good life down in the zone. The best of his many off-speed pitches was a short, quick slider at 72 mph. He also threw a curveball, change up and knuckleball. As an outfielder, Brown showed exceptional speed for his size at 6.70 in the 60 and 4.32 to first base. He has a nice swing at the plate with good leverage at contact and plus power potential. How Brown develops as a prospect and at which position is difficult to project because he is still raw, but you won’t find many better athletes who combine Brown’s speed, power and balance. Highest level prospect and a big-time sleeper. PG rated him a 9.5 prospect in 2005, his junior year of HS, and was looking at him as a pitcher. With his Miami football gig in his back pocket, he fell out of the first few rounds and all the way down to the Phillies in the 20th round. The Phillies invested $200,000 in him and got him signed away from school, one of their finest draft pick maneuvers ever. Career Synopsis: Brown got off to a rough start in his pro career, putting up a .214/.292/.265 line in 131 PA in the GCL. He did draw 12 walks, an early positive indicator, and he also went 13/16 in SB. Brown did not pop up onto the radar, as BA left him off their Top 20 prospects in the GCL and also chose to not include him in their Top 30 prospects list in the 2007 handbook. The Phillies took it slowly with Brown, sending him one level up to Williamsport in 2007, and he got a brief 3 game cameo at Clearwater before he started the season. Brown hit .299/.363/.415 in 328 PA at Williamsport, with 21 extra base hits, 14 stolen bases and 29 walks. Brown was rated the 15th best prospect in the NYPL in 2007, and then ranked as the Phillies 6th best prospect in the 2008 BA Handbook. Brown moved up to Lakewood in 2008, hitting .291/.382/.417 in 516 PA, his first full season, and did a bunch of things well, including accumulating 35 extra base hits, stealing 22 bases, and drawing 64 walks against only 72 strikeouts. 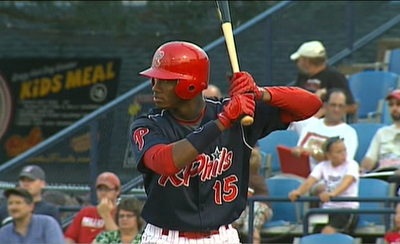 Despite an excellent season, Brown failed to crack the SAL Top 20, but was ranked as the Phillies top prospect by BA. 2009 would become Brown’s big breakout, as he hit .303/.386/.517 in 280 PA at Clearwater before getting 162 PA at Reading, where he struggled to get settled in. Nevertheless, the power began to emerge and hinted at what was to come. Scouting Report: Dating back to high school, Brown was lauded for his all around athleticism and complete package of tools. Tall with long arms and legs, Brown does all the things you’d expect from a good athlete, including running well for a man his size, hitting for power, and showing a great, prototypical right field arm. What separates Brown from the average “athletic outfield prospect” is his baseball instincts. Going all the way back to rookie ball, Brown has always had a good idea of the strike zone, and he’s always hit for a solid average. Scouts were split over his ultimate power upside, but he’s answered most of those questions over the last season. Summary: Brown is a well rounded prospect, with the potential for 4 plus tools at his peak, with potential to hit 30-35 HR per season in his prime. He struggled at times in his MLB debut, but it was a small sample of ABs, and he wasn’t getting regular playing time. The only tool that currently rates as below average is his fielding, as he often struggles on routes to fly balls. His arm is above average, and will be a weapon as he gains experience. Upside: With the emergence of his power, Brown has the capability to hit 30 HR, and even that might be conservative. He doesn’t have massive problems with strikeouts, and should make enough contact to hit .275-.295, maybe even hitting .300+ in a given season. What he will lose in batting average he should make up for in walks, as he has a good idea and feel for the strike zone. Without a platoon split, Brown should play every day, and could hit anywhere from 3rd to 5th in the lineup during his prime. His setup is very quiet, he doesn’t have many moving parts, and his swing is very simple. In the past, the one concern scouts had was his tendency to “drift” toward the plate, ie, getting out on his front foot, which would diminish his power. Charlie Manuel worked with him in spring training 2010 to stay back on the ball a bit more and get a better rotation with his hips. Brown has responded with 19 home runs in 2010, 5 more than his career high 14 in 2009, and that is through only 330 PA’s. Brown has extremely strong wrists, which helps him to create excellent bat speed through the zone. While he isn’t going to be a speedster and steal 30 bases a season, he runs well and has a very long stride, which will help him when he’s under way and trying to leg out doubles and go 1st to 3rd. Defensively, his route running is erratic at times, but it is something that should improve with more reps. His arm is a true plus tool, and he profiles defensively as a prototypical right fielder. One of the biggest strengths in Brown’s game is the lack of a platoon split, as he has handled lefthanded pitching, even at the higher levels of the minors. Updated to include the profile updated date, additional videos, and a summary of the tools grades.